An emerging way of installing bridges was touted as an “engineering feat,” a model for the future with safety at the forefront. Now just five days after being installed using that method, a bridge connecting a college campus to a nearby residential area collapsed over a busy highway, killing several people. The bridge was built in full before being rotated and moved into place over a portion of 8th Street, US 41, in just a few hours. The 174-foot, 950-ton section of the bridge was built to the side of where it was eventually rotated over eight lanes of the highway, according to a press release announcing the installation of the bridge. 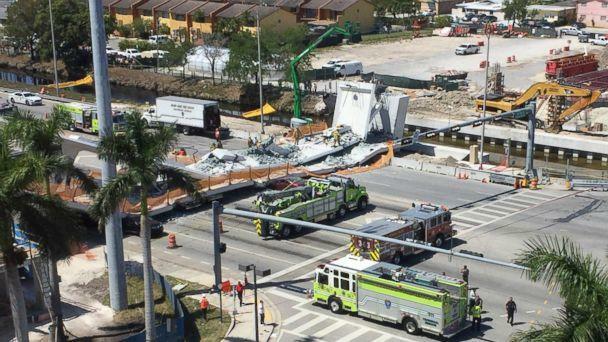 The pedestrian bridge was intended to provide a safe passage for students from Florida International University, which has its campus on one side of the highway, to a neighborhood called Sweetwater, where thousands of students live. The bridge was not yet open, but the installation process had been celebrated as an engineering success. The press release said the FIU-Sweetwater UniversityCity Bridge was the largest pedestrian bridge moved using self-propelled modular transportation. That method involves a large vehicle with a flat platform that is used to move large segments of pre-constructed materials that are then lifted into place. “It will be the largest pedestrian bridge move via a Self-Propelled Modular Transportation (SPMT) in U.S. history,” according to a fact sheet released by FIU and the City of Sweetwater. 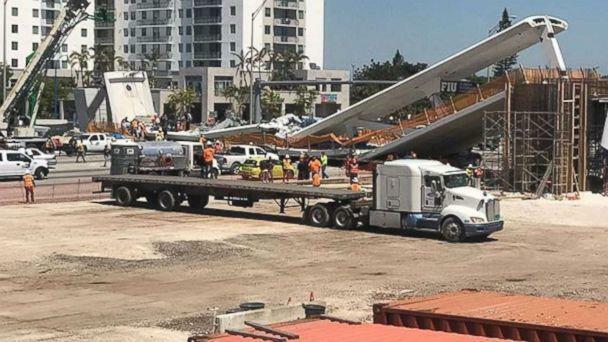 The release quotes Atorod Azizinamini, the chair of FIU’s civil and environmental engineering department, and the director of the school’s Accelerated Bridge Construction University Transportation Center, which specializes in this type of construction. “Building the major element of the bridge – its main span superstructure – outside of the traveled way and away from busy Eighth Street is a milestone,” Azizinamini said in the press release. The bridge cost $14.2 million and its funding came as part of a $19.4 million grant from the U.S. Department of Transportation. Construction of the bridge began last spring; the bridge was expected to be completed early next year. It was designed to withstand a Category 5 hurricane and have a design life that would exceed 100 years, according to the fact sheet. “At this point, we would have to have a plan to go back and look at the design parameters that were used to design this bridge,” Baroud told ABC News. “Any problem related to the beginning life of a structure is related to its quality, whereas the reliability of a structure is maintaining that quality over time,” she said.